These turtles were named after the red-line that borders their ears. They are predominantly aquatic leaving only to bask in the sun and to build terrestrial nests. The female sliders are larger than the males. 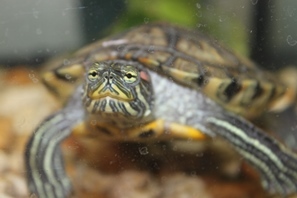 These turtles breed prolifically laying up to 2 and half dozen eggs per clutch. They could lay five clutches per year. They are popular as pets are are considered an invasive species.